Hummus Chicken | Om nom nom! Another baked chicken recipe; I wish I could say I remember where I first saw this…Pinterest, maybe? Regardless, it’s on a lot of blogs now. We really liked it. The hummus coating kept the chicken very moist while it baked, and formed a nice crust. I think it will be even better with different types of hummus, but it was definitely worth repeating, and can’t beat the relatively low cal. 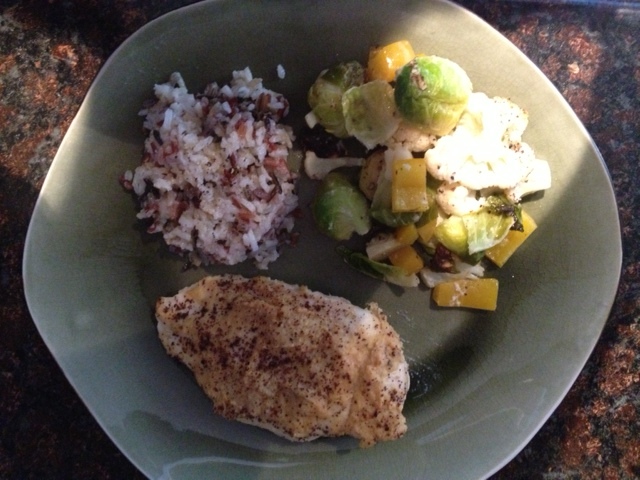 I served this with roasted brussels sprouts, cauliflower, and yellow pepper, and a wild rice mix. Vegetables of any kind – broccoli, cauliflower, sprouts, squash, etc. Prepare vegetables of choice and toss lightly with olive oil, salt and pepper, and crushed garlic. Spread evenly at the bottom of a roasting pan. Lightly season chicken breasts with salt and pepper. Spread one tablespoon of hummus over each piece of chicken, coating all sides. Place chicken breasts on top of vegetables. Squeeze juice from one lemon over vegetables and chicken. If you like, you can slice the lemon and roast it with the vegetables. Sprinkle sumac (or smoked paprika) over the chicken and vegetables and roast for 30-40 minutes, or until chicken is done. This was a great base recipe with a lot of options. We have a kalamata olive hummus that we like a lot, and might give that a go next time. All in all, very tasty and low cal at 350 calories a serving, including veggies.